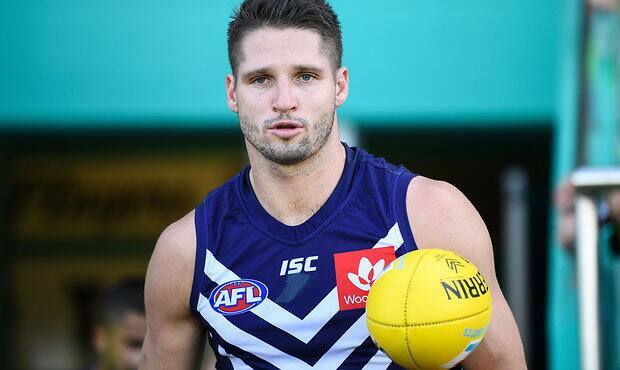 FREMANTLE’S marquee forward recruit Jesse Hogan is under serious consideration to be shifted to defence for a week if Joel Hamling doesn’t overcome concussion in time to face Greater Western Sydney, coach Ross Lyon says. After years wooing Hogan from Melbourne, the Dockers appeared to solve their post-Matthew Pavlich attacking riddle when the 24-year-old and Rory Lobb were secured last NAB AFL Trade Period. However, Lobb was preferred in the ruck in the Western Derby, and Hogan, who has 153 goals from 74 career games, could be on the move again after spending large chunks of game-time in midfield on his Dockers debut in round two. “When you’ve got real extreme football intelligence and capabilities, good players play anywhere and make a fist of it without being specialised,” Lyon said. “Matthew Pavlich was a great example, wasn’t it? On the run last week we discussed Jesse going back (after Hamling went down). “But we stuck with the undermanned piece because our pressure was good, but he was the one we would have rolled back. Young swingman Brennan Cox and last round’s emergency Ryan Nyhuis are other options to come into defence for the task of shutting down dangerous tall trio Jeremy Cameron (17 goals), Jeremy Finlayson (eight) and Harry Himmelberg (four). While Freo will be boosted by superstar Nat Fyfe’s return from concussion, Hamling needs to pass a cognitive state test and train on Thursday to be cleared to play before the Dockers fly to Canberra. “You give everyone their best opportunity, but there will be no risks taken,” Lyon said. “He’s a key pillar down there. Hogan pushing into the backline could help Lyon balance the side if young ruckman Sean Darcy returns to take on man mountain Shane Mumford, with Lobb returning to his preferred forward-ruck role. “We’re considering that (two ruckmen) anyway, regardless, because we’ve done that before,” Lyon said. “There was some challenges interstate with the team and conditions and all those things (against Gold Coast in round two), but Sean got hurt early in that game and his mobility was restricted. Lyon’s Dockers have won only one of their past 13 interstate trips and will take on a GWS outfit brimming with confidence after one of the most significant victories in club history at Geelong. Ex-Freo tough nut Matt de Boer seems likely for a run-with job on Fyfe, and Lyon will consider sending a tagger – potentially Reece Conca, Andrew Brayshaw or Adam Cerra – to one of the Giants’ star midfielders if they get off the leash. “They’ve got some talent, haven’t they? They’re flying, they’re absolutely flying,” Lyon said. “We’ll consider it, we haven’t done it yet, but again I’ve sort of moved and thought maybe we adjust on the run. “(I have) incredible respect for Matty, and it’s unfortunate where we were that he’s not here but it’s great to see him flourishing.